My story BERASTS was published in issue #2 of High Heaven, with an illustration by Elliott Mattice running alongside. Click on the photo of the comic and check out my post on Ledger about the publication, along with some thoughts regarding how I came up with the idea for this piece of flash fiction. An anthology of short stories related to the city of Indianapolis, Mythic Indy will take readers through, around, under, and above the capital of the Midwestern United States' heart. thinmanlittlebird is the tale of two sculptures in front of the Indianapolis Central Library, and the forces which aided their arrival. It's a sci-fi/fantasy exploration of the artistic impulse, and the merits of breakfast food. Maybe not so much the second one, but there is a mention or two of that particular meal. All proceeds from sales go to support Second Story, an Indianapolis-based organization helping young kids develop reading and writing skills. Buy a copy here. 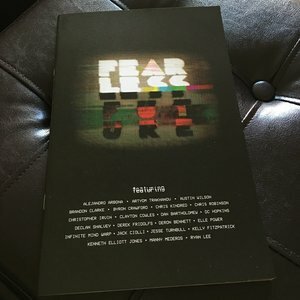 A sci-fi compilation edited by Marvel editor Chris Robinson, Fearless Future was successfully crowdfunded through Kickstarter. My story, Roth, was illustrated by Manny Medeiros, colored by Jesse Turnbull, and lettered by David C. Hopkins. In a future where mankind has sought out new worlds, we join a crew visiting the planets which support life, and follow them through the steps they take when such a place is located. The captain of the crew, Roth, makes a decision to alter his own life, and all who are aboard the ship traveling from planet to planet.